TAKE an actor from Emergency-Ward 10, an actress from the Third Programme and three children all aged 13 and a half, and what have you got? Well, if you're Dorothea Brooking of BBC Children's TV, you've got . . . 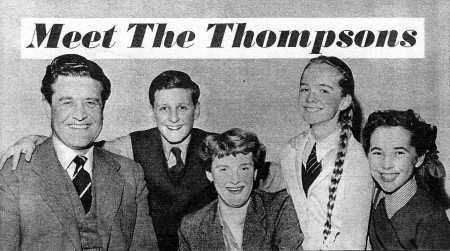 The Thompson Family. You'll be seeing the Thompsons for the first time on Saturday, in Part One of a ten-part serial. Remembering the Armstrongs, the Groves, and the Appleyards, I asked Dorothea if she thought there was house-room for yet another family series. Her answer was straight to the point: "I don't see why not. They're always popular. . . and anyway this one's going to be different." How? Well, unlike The Appleyards, The Thompson Family will be in serial form, with each episode carrying on from the last, There'll be less comedy and more emphasis on the everyday happenings of family life. That's all I can tell. But it doesn't really matter, for the story-line is only a peg on which will be strung a series of family incidents designed to make young viewers say: "Why... that's just like us !" "Dad," for instance, is typical of a million dads all over the country: solid, pipe-smoking . . . a kind of Jack Hawkins out of uniform. Playing him is John Paul, himself the father of three youngsters--"though they're hardly out of the rompers stage yet." Unlike many actors, John doesn't fear the scene-stealing antics of so many child performers. "I love playing with kids," he says. "They've got so much enthusiasm it's infectious." Quite an enthusiastic type himself is John. Just the man to play Mr. Thompson - described in the script as "an ex-RAF officer turned architect." Though John's own war experiences were less happy. "I spent much of it behind bars--in a POW camp. It was there I first became interested in the stage, After my release, I went into rep and I've been acting up and down the country ever since." Which is a typically modest way of describing a career that's on the up-and-up. ITV viewers will already know him as the "R.S.O." in the Emergency-Ward 10 series. Playing 14-year-old Susan is Diana Beevers, actually aged 13 and a half. She's delighted to be adding six months to her age: "I can't wait to get older, and sink my teeth in some real grown-up parts,"
"What kind of girl is Susan Thompson ?" Diana wrinkled her nose in thought. "Well . . . I suppose you'd say she's the studious one in the family--a bit of a swot. She's always bossing the other two around." Obviously the prospect of doing this filled Diana with pleasure. Not so the "other two"--Andrew (Nigel Lambert) and Caroline (Sandra Michaels) who were standing nearby. Noticing the sly grins on their faces, I couldn't help feeling that "Susan" was going to have quite a lot of trouble with her "brother" and "sister" when the serial got under way. In fact, young Sandra Michaels---who bears a striking resemblance to the younger Janette Scott --confessed that her new part gives her an opportunity she's longed for. 'Im the one who's always in hot water," she confided. "It makes everyone's life a misery - especially poor Mum..."
"Poor Mum," as played by Marion Jennings, will be absent-minded, lovable and a fervent fan of those big-money competitions in the papers. Of course she never wins much, but the fact that she keeps tryng is good for laughs right through the serial. Marion is looking forward to the part--a big break from her succession of "heavy" roles on the Third Programme. "And it shouldn't be too difficult,'' she says. "I really am absent-minded." Not so absent-minded, though, as the stage-hand responsible for her most embarrassing moment as an actress. "It was my very first show. I was playing a maid in one of those gaslit Victorian dramas, and I had to sweep on in my long skirts and announce someone. Well, I swept on all right, but the whole audience immediately burst into a roar of laughter. It was the kind of thing one dreams of in a nightmare. Then I felt something pulling at my skirt, and looking round I saw that a stage-hand had put down an artificial tree on it by mistake. As I walked on, the tree had followed. I've never been so mortified... !" In the serial, the family will be seen living at "No. 10, Pond Street'--an imaginary address, but not an imaginary house. True, the interiors will be built in the studios in the usual way, but exterior shots are to be pre-filmed outside a real house in South London. How did they find it? "We knew the kind of house we wanted," said Dorothea Brooking. "So we started a systematic search all over London. We must have driven hundreds of miles. Finally we found the perfect place. We wrote to the owner and got permission to film the front of the house, and also the permission of the next-door neighbours, whose house will appear in the story as No. 12 Pond Street--the home of Guy, the boy-next-door. Everyone was very sweet and most cooperative." Will the Thompsons make a return after their first ten weeks of television fame? Dorothea wasn't sure. . .
"It depends on how well the viewers like them. If they're a tremendous hit, then obviously we'd think about doing a second serial. But I must emphasise that this is a serial rather like a more up-to-date version of The Railway Children--and not one of those complete-in-every-episode kind of programmes." So it all depends on the viewers--the younger viewers, that is. But it's my bet that "No. 10, Pond Street" will become as familiar to many thousands of youngsters over the next ten weeks as their own home--and just as loved.